Stranded on a mysterious desert island, Bloodshot is running for his life! But as he tries to make sense of his surroundings, he's quickly discovering that this is no ordinary tropical getaway? Surrounded by decommissioned relics of the same bloodstained project that created him - World War II Bloodshot, Cold War Bloodshot, Vietnam Bloodshot, and other antiquated experiments - Bloodshot is about to find out where Project Rising Spirit sends it old soldiers to die. Can this seasoned band of killers trust each other long enough to survive the threats that lie in the jungle around them?and unlock the secret at the heart of the island's existence before they're each permanently retired? 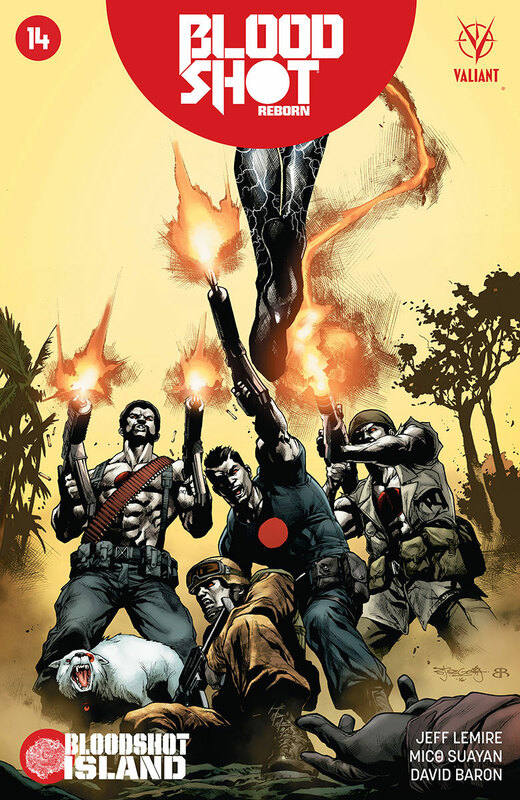 This summer, superstar creators Jeff Lemire (Extraordinary X-Men) and Mico Suayan (BLOODSHOT REBORN) send Bloodshot screaming into his most action-packed adventure yet as 'BLOODSHOT ISLAND' ups the ante for the Valiant Universe's most formidable man-at-arms!